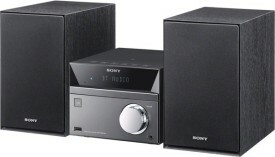 A classic three-box Hi-Fi combines a built-in CD/DVD player, radio tuner, and USB input with a sleek, modern design. Two compact, standalone speakers provide flexible setup options, so you'll be able to find the perfect Hi-Fi arrangement for any room. Easy Bluetooth® connectivity with NFC One-touchMega Bass adds low-end powerUSB playback and smartphone chargingIntegrated FM radio tuner. MANUFACTURED BY SONY UK.